Last year, scientists in China used a gene-editing technique to produce pint-sized pigs for medical research. Now they want to sell them as pets. Critics say the precedent could lead to bizarre versions of cats and dogs, while at the same time preventing biologists from focusing on more important research. 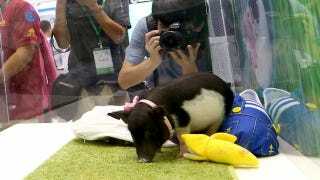 As reported in Nature, BGI in Shenzhen originally created the pigs as models for human disease. Because of their diminutive size, the pigs don’t take up as much space as their larger counterparts, nor do they require as much food. These miniature versions of Bama pigs weigh a mere 33 pounds (15 kg) when full-grown, roughly the same as a medium-sized dog. By contrast, a normal Bama pig weighs as much as 220 pounds (100 kg) when fully grown. The pigs were engineered using a gene-editing technique known as TALENS. Before creating cloned pigs from a Bama fetus, the BGI researchers used the technique to knock out one of two copies of the growth hormone receptor gene (GHR) in fetal cells. This resulted in the birth of “stunted” pigs, which were in turn bred with normal pigs. The scientists say that the micropigs aren’t exhibiting any adverse health effects, even after 20 generations. These animals have already been used in studies of stem cells and gut microbiota. Last week, the researchers announced that they want to start selling the pigs as pets, and have set an initial selling price of 10,000 yuan, or $1,600 each. The firm also plans on selling pigs with different colors and patterns in the future. ...gene editing will not solve other drawbacks of pet pigs, says Crystal Kim-Han, who runs a rescue operation for abandoned pigs near Las Vegas, Nevada. For instance, if the animals are locked up in an apartment with no place to root or dig, they can become destructive. She also expects micropigs to have additional medical problems, similar to pets created by selective breeding. “What happens down the road when these animals need care?” she asks. And as geneticist Daniel Voytas told Nature, this kind of attention could potentially hamper progress in developing gene-editing techniques for treating human disease and new crop varieties. As an aside, micropigs aren’t, or won’t, be the only game in town. Brace yourselves for horse-dogs, plantimals, and mini-rhinos. Read the entire article at Nature.